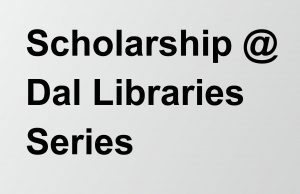 Dal Libraries is launching a new seminar series this month focused on research tools and services. This series will focus on a range of topics going forward but the fall 2018 sessions will focus on aspects of the publishing and research process including research reporting, rights and impact. Wednesday, October 24, 12–1 p.m.
Friday, November 9, 12–1 p.m.
Friday, November 23, 12–1 p.m.
Friday, November 30, 12–1 p.m. This is the fourth and final entry in our series of blog posts recognizing Fair Dealing Week 2018 (February 26–March 2, 2018). The copyright landscape in Canada has undergone significant changes recently. To ensure a fair and reasonable approach to the use of copyright protected materials on campus, Dalhousie has sought to balance the rights of users with those of creators. To help accomplish this, the university has established a Copyright Office and has most recently adopted updated Fair Dealing Guidelines. As students of Dalhousie University, you may copy materials for which the university (e.g. the Library) has negotiated licenses, according to the terms of the individual license agreements. In addition to license agreements, fair dealing allows you to make use of a work for yourself for the purposes of private study, research, criticism or review, news reporting, education, parody or satire. This is part three in a four-part series of blog posts recogning Fair Dealing Week 2018 (February 26–March 2, 2018). Fair dealing is a powerful tool for using copyrighted works in the classroom. It allows instructors to use photos and videos in class lectures, reduce the cost of materials for students, and facilitate access and accommodation for students. Faculty can also benefit from fair dealing in the context of research, allowing academics to build upon existing research, and facilitating access to scholarly works. Fair dealing is available in the contexts of education and research, but it is important to remember that copyright in Canada is a balance between users’ rights and the creator’s rights. So, while instructors can engage in copying for their classes, it must be done in a fair and ethical manner. One of the best resources to make sure your class readings fall under fair dealing is to make use of the Dalhousie Libraries Course Reserves Service. By using course reserves, you can help take the guesswork out of applying fair dealing guidelines for every work that is used as part of class readings, and reduce the cost of material for your students. Course reserves can upload material to Brightspace, or create Stable Links to course readings. We are pleased to welcome Lachlan MacLeod to the staff of the Dalhousie Libraries, effective January 3. Lachlan will have a busy schedule, including ensuring all copyrighted materials have been cleared prior to production or use, working closely with the eReserves team on providing library resources to students through Brightspace, responding to a wide array of inquiries from Dalhousie faculty, staff and students on copyright-related matters, and promoting open access resources. There is a large component of his position that will be educational in nature, working with the Copyright & Humanities Librarian in delivering presentations to various faculties and departments, providing updates on developments in the copyright landscape in Canada, and demonstrating how the Copyright Office can assist faculty and staff in maintaining compliance with current copyright legislation. Lachlan is a graduate of both King’s and Dalhousie. He holds a Master of Arts in sociology, and his thesis focused on qualitative comparisons between practices of Halifax artists and national copyright policy. In addition to his background in copyright research, Lachlan was previously employed at Dalhousie as a student assistant in the sociology department, and in two positions at the Atlantic Research Data Centre, located in the Killam Library. Lachlan will be based out of the Copyright Office, which is on the fifth floor of the Killam Library. If you have questions about copyright, contact copyright.office@dal.ca or (902)494-4346. The Harvard Business Review (HBR) has recently made changes to its licensing provisions, which affect links to the material in Brightspace. Previously, our license with HBR stated that we could not include materials from their database in Brightspace or any learning management system (LMS), but we could provide permalinks to HBR content in the LMS. This has recently changed and our subscription with HBR now requires that we refrain from linking to any HBR content in either Brightspace or on course syllabi. We ask that all faculty and instructors review their Brighstpace course spaces and syllabi and remove any permalinks to HBR material, and also that they refrain from including any in the future. To use HBR material in a course, provide the citation to the material without the permalink. Students will be able to search for and access the material from the Library’s main page: https://libraries.dal.ca/ HBR can be accessed by searching for “Harvard Business Review” in the e-journals tab on the Libraries home page and then supplying the appropriate citation information (date, volume number, issue, and start page). Students can visit any library service point or contact the libraries (see https://libraries.dal.ca/help/ask-us.html) for help on searching for and accessing the articles. We understand the frustration this may cause you and your students, but we appreciate your understanding and assistance in this matter. Failure to remove permalinks to HBR content from Brightspace and syllabi (and to abide by the terms of our license agreement generally) can result in all Dalhousie faculty, staff, and students losing access to this resource. If you have any questions about this change, or about options regarding the use of HBR materials in your classes, please do not hesitate to contact the Copyright Office at Copyright.Office@Dal.ca or 902-494-2003. We want to thank you again for your understanding, and for helping to foster sustainable copying practices at Dalhousie. This is part two in our series to celebrate Fair Dealing Week, part three (on students and fair dealing) will appear on Friday. Fair dealing is a powerful tool for using copyrighted works in the classroom. Historically, it has been an underused concept in the educational sector, but this changed drastically in 2012 when two things happened. First, the Supreme Court of Canada issued five decisions on intellectual property — one of which dealt directly with classroom copying, and came down strongly in favour of classroom copying. Second, the Government of Canada amended the Copyright Act to include education as one of the protected categories of fair dealing. The Character of the Dealing: Are you planning to make multiple copies, or only one? Will they be destroyed after use? The Amount of the Dealing: How much of the work is being copied? Are you only copying what is absolutely necessary from the work? Alternatives to the Dealing: Could you have used a non-copyrighted alternative instead? The Nature of the Work: Was the Work copied intended to be confidential? The Effect of the Dealing on the Work: Is the copying likely to affect the commercial value of the work? These factors are weighed together by the courts to decide, on the whole, whether the dealing is more or less fair. Of course, in the interests of helping you apply these criteria, Dalhousie has adopted a list of fair dealing guidelines. These guidelines take into account the above six factors, and provide guidance on what can and cannot be copied in an educational setting. You can learn more about them here. Fair Dealing: What is it? Fair Dealing Week (Fair Use Week in the United States) is the Association of Research Libraries (ARL)’s annual celebration of fair dealing. 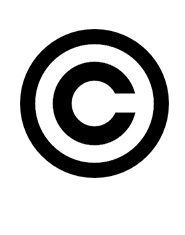 Fair Dealing is a right in the Copyright Act (Section 29) which allows the copying and communicating of copyrighted works without permission from or payment to the copyright holder in certain contexts; namely for research, private study, criticism, review, news reporting, education, satire, and parody. Why, though, should members of the Dalhousie community care about fair dealing and Fair Dealing Week? It’s easy to see how this concept can be useful for a university community. Professors can rely on the education category to reproduce articles for students and students can make copies of material for their own research or private study. This week we celebrate Fair Dealing Week by providing two additional blog posts (one on Wednesday and one on Friday), outlining what fair dealing means to instructors and to students. Copyright Office presents on changing Access Copyright Licensing Agreement. To prepare for these changes, the team at the Copyright Office has had a busy fall providing 26 presentations on copyright to many of the university’s departments and faculties (including FASS, Science, Engineering, Health Professions and Medicine). The goal of these short, 10-15 minute, presentations has been to discuss the changes in licensing, why they are important and the tools that faculty and instructors have at their disposal in making materials available.Although the major discussion has focused on Fair Dealing and licensing changes, the presentations have served as springboards for discussions on various copyright issues. Check out some Common Copyright Questions. Interested in having the Copyright Office team present to your faculty or department? Contact Copyright Services Coordinator, John Yolkowski by email at jyolkowski@dal.ca, or by phone at (902) 494-4346. Thank you for helping foster sustainable and ethical copying practices at Dalhousie! 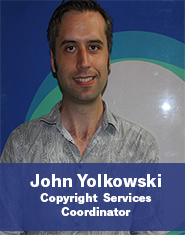 We are pleased to welcome our new Copyright Services Coordinator, John Yolkowski! John is not a stranger to the Dalhousie Libraries. For the past year, he has been the project manager for the Elisabeth Mann Borgese Digitization Project, working with the Research & Scholarly Communications / Archives team on the fifth floor of the Killam. 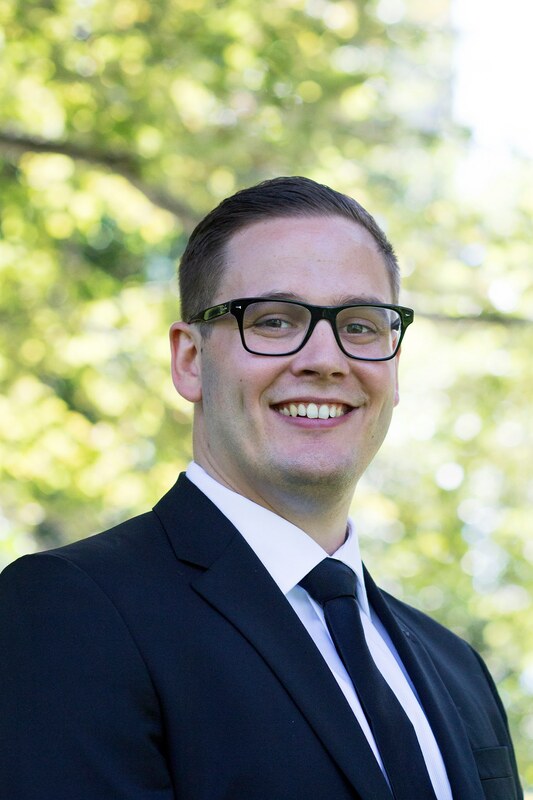 John’s educational background includes an MLIS from Western and an MA from Guelph. He has previous experience working in archives, research, teaching, and providing chat reference service with OCUL’s Scholars Portal. Whether it’s booking a film screening on campus, putting course materials into Blackboard, applying Fair Dealing, or learning about Creative Commons licenses, John is looking forward to answering any questions staff, faculty, or students have about how copyright affects them. Part of this work will be educational in nature, and he especially excited about delivering a series of presentations to various faculties here in the coming months to discuss copyright at Dalhousie. John will be based out of the Killam Library. If you have questions about Copyright, contact copyright.office@dal.ca or 902-494-4346.